from Evpatoria Deep Space Center"
This Report outlines methodology, hard- and software, which were developed to transmit first public Interstellar messages from Evpatoria Deep Space Center (EDSC), and describes four Cosmic Call Sessions, which were fulfilled in EDSC on May 24 and June 30 - July 1, 1999. The lines [RA + LY * PMRA] and [Dec + LY * PMDec] denote the actual values of Right Ascension (RA) and Declination (Dec), which are accounting the distance LY and proper motion PM, and which were used for computations of elevation and zenith angle of given star during its tracking by Evpatoria antenna. 4. Encounter 2001 Staff Message. For explanation of message's content please visit www.teamencounter.com. Each above messages are the binary ["0" & "1"] streams of information, separated to each other by 5 second pauses. As a result, we have the ternary situation: ["0", "1", and "pause"], so need to use the ternary modulation to transmit the Cosmic Call. We have used the frequency modulation for this purpose, as more suitable for reliability of power klystron transmitter and for more antijamming, than amplitude one. The EDSC hardware was upgraded to introduce the frequency modulation mode. The coherent frequency synthesizer Ch 6-36, controlled by personal computer via custom-built interface, was used. Also, the special device to exercise of power klystrons, was developed. The Part I was transmitted three times at a rate 100 bits per second, and the Part II - only once at a rate 2000 bits per second. 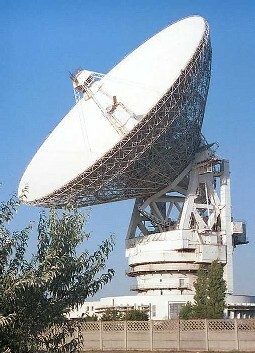 The first Cosmic Call was transmitted on May 24, 1999, to the target number 2 - star HD 186408. Three other transmissions were made during the night June 30 - July 1. Table 2 contains an information about all four Cosmic Call Sessions. Transmission Rates: 100 Hz for Part I and 2000 Hz for Part II. Frequency Deviation: +/- 24 kHz ("pause" = 5010024 kHz, "0"= 5010000 kHz, "1" = 5010048 kHz), both for Part I and II. The most difficult problem, which occurs during long (few hours) transmission is a short life of power klystrons. At present we have only one reserve klystron, unfortunately, so plan to develop special device to regenerate the cathodes of defect klystrons. Also, hard- and software are needed in some modifications in order to increase theirs flexibility and reliability before next Cosmic Calls.